Use the buttons above to show your love! With your help, this idea will take center stage at the AHA Health Science Innovation · Investment Forum. All your tweets, likes, donations, and support go to form 60% of the judging decision, so show the world you care about this idea and watch it take off! Check out the rest of the finalists, too. Note: all donations and backing are tax deductible. Help this project win by backing or donating to the AHA on this page. We will thank you on our web page. We will thank you on our web page and send you an HRS pen. PATIENTS - We sign and send you or a loved one up on our tablet for 60 days to help them manage a patient. Readmissions are painful and deadly. So why is it that of 1.1 Million failure patients 25% are back within 30 days despite the majority of episodes being preventable? Patients readmitted to hospitals within 30 days of discharge experience significant personal and financial hardship, as do their families and caregivers. Now, under Medicare laws, hospitals with high readmission rates also experience financial hardship in the form of millions of dollars in penalties. Hospital resources are not effective in implementing real-time outpatient monitoring and clinician coordination. HRS provides a cost effective solution that not only saves on Medicare reimbursement, but also improves delivery of care. Quality of life is improved for the hospital’s highest risk patients. 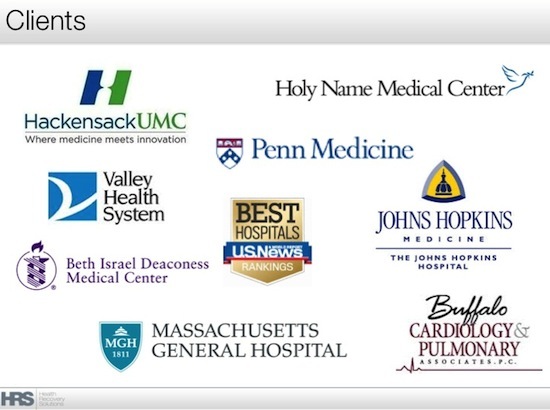 Health Recovery Solutions is working with the leading medical centers to reduce readmissions and is gaining national attention for its clinical successes and commitment to significantly improving outcomes for both patients and hospitals. We provide hospitals with a real-time, patient-centered platform that helps to track medications, weight, activity, and symptoms. Our patented software, loaded on 4G tablets meet personal patient needs, creates a social support network by connecting patients with clinicians and caregivers. The tablet addresses the most common causes for readmissions and focuses on patient engagement. Hospitals manage existing patient adherence methods more efficiently via our cloud alert system, mobile apps and clinician dashboard. This data is integrated seamlessly into hospitals EMR and workflow to create an end to end solution. While in the hospital, patients are provided a 4G internet-ready tablet pre-loaded with HRS software. Patients can utilize this to educate themselves on their condition via informative videos, diet information, and teach back quizzes. At discharge, patients are sent home with the tablet along with integrated wireless monitoring devices (including blood pressure monitors, pedometers, digital scales, and pulse-oximeters). Patients are reminded daily to enter important data such as medication compliance, blood pressure, weight, physical activity, symptoms, and diet. The data is sent to the cloud in real-time where our predictive analytics and proprietary algorithms then alert clinicians and caregivers to a patient’s deteriorating condition allowing care teams to intervene. HRS’s was founded two years ago at Johns Hopkins University with the mission that “outpatient care is as important as inpatient care and that the elderly can utilize technology for their own wellbeing.” We have worked tirelessly and are proud to say that we have positively affected over 100 high risk patients with conditions of Heart Failure, COPD, and Diabetes. Our goal’s to reduce avoidable readmissions, save lives, and alleviate hardships for patients. American Heart Association’s 2020 Impact Goal for patients mirrors those of Health Recovery Solutions. Our partnership would be a mutually beneficial and collaborative relationship. Our patient feedback has been phenomenal, one female patient reported, “the tablet kept me motivated and organized." Similarly, a male patient in his eighties said, that “medication reminders were a huge help and the video chat enabled me to ask my nurse small questions that had a big impact." Now, under Medicare laws, hospitals with high readmission rates also experience financial hardship in the form of millions of dollars in penalties. Our platform is currently being used at 7 leading medical centers. Massachusetts General Hospital, Boston; Beth Israel Deaconess Medical Center, Boston; Hospital of the University of Pennsylvania, Philadelphia; Hackensack University Medical Center, Hackensack; Holy Name Medical, Center, Teaneck, Buffalo Cardiology & Pulmonary Associates, Buffalo, Valley Hospital, Ridgewood. Results have been remarkable. In a randomized 50 patient study at Hackensack University Medical Center and Holy Name Medical Center, heart failure patients utilizing the tablet had an 8% readmission rate compared to a 28% readmission rate for patients who did not receive the tablet. The average patient was 71 years old and had an ejection fraction below 40%; the readmission rate was calculated on a 30 day period. Another benefit: patients in the tablet group averaged a 5 pound weight loss. To date, three founders have invested approximately $80K in total to fulfill our mission that, “outpatient care is as important as inpatient care and that the elderly can utilize technology for their own wellbeing.” We have been lucky enough to have angels invest, helping to manage sales cycles and let our company get off the ground. Funding would be directed to implementations, server, equipment and research studies. Most importantly it would help get our platform in the hands of more patients.